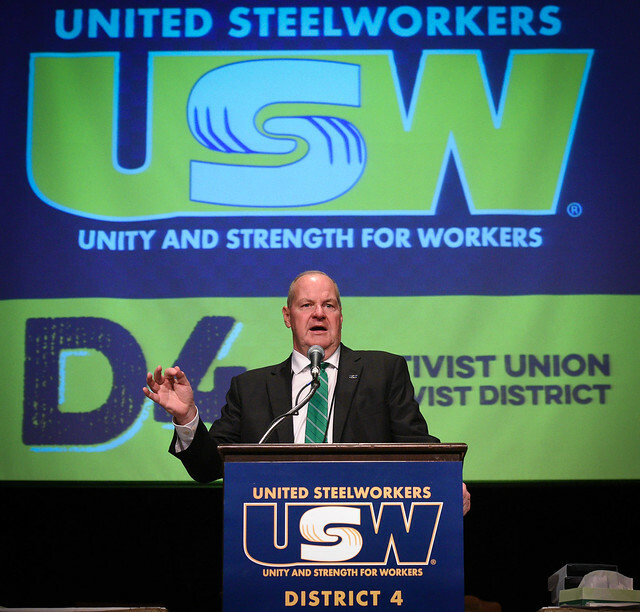 The USW District 4 educational conference kicked off this week in Atlantic City with more than 500 delegates hearing from a series of union leaders, politicians and most notably fellow sisters and brothers still suffering from the devastation of last year's hurricanes and members locked out by National Grid. It was an emotional start to a week full of classes on topics ranging from organizing to health and safety, civil rights, digital communications and more. Members and staff who live and work in Puerto Rico gave a panel presentation on the lack of response by the government and the continued struggles people continue to face. "My neighborhood is as destroyed today as it was a year ago," said Mayra Rivera of Local 8198. Delegates donated toiletries and other items for Puerto Rico as well as funds. Another emotional moment was when members from USW Locals 12003 and 12012 spoke about being locked out by National Grid after members stood together to fight against tiered benefits and other concessions proposed by the company. "The solidarity and unity on display makes me so proud to lead this district," said Director John Shinn. "We are a union that from our founding days said that everyone's in, that we would fight together for everyone. That's what makes us stronger. What is happening here shows are values are time-tested and still guide us today." Check out these images from the conference, courtesy of UnionPix. The Centers for Disease Control and Prevention and the National Institute for Occupational Safety and Health prepared an information sheet to describes what a user seal check/fit test is. Click to read more.